Here in Wales, we have another opportunity to celebrate love. January 25 is St Dwynwen’s Day. She is saint of Welsh lovers. According to the story, Dwyn or Dwynwen was one of Brychan Brycheiniog’s daughters. She lived in the sixth century. She was a very beautiful girl and many young men had fallen in love with her. One young man, called Maelon, loved Dwynwen and wanted her as a partner. But Dwynwen was not interested in Maelon. So Maelon kidnapped her and raped her. Dwynwen was very sad. While she cried, an angel came to her. The angel said that God had turned Maelon into a lump of ice because he was so cold hearted. But Dwynwen asked an angel to turn him into a man again. Dwynwen said she wanted to forget about Maelon and for lovers. She wanted to work for God, she said. So, the angel sent her to North Wales and Dwynwen came to Anglesey. She went to live on a small peninsula – Ynys Llanddwyn near Newborough today. This was where she lived and worked. She became a saint and then the patron saint of lovers. In the Middle Ages, lovers used to go to Llanddwyn to pray for Dwywen’s help. Today, if you go to Llanddwyn, you can see the remains of the church and well of Dwynwen. This festival, for Welsh learners, will be held in various locations across Wales – St Fagans National Museum of History, Cardiff; the National Waterfront Museum, Swansea and National Slate Museum in Llanberis – and the National Library of Wales, Aberystwyth. A range of activities will be available at each site throughout the day. On the first of March, 589 A.D, Archbishop Dewi died peacefully at his home in St David’s, Dyfed. The Archbishop’s history is interesting. His mother was a nun called Non. She had decided never to marry but was raped by the king of Cardiganshire, Sant son of Ceredig. After the child’s birth, Non, who was a niece of King Arthur, went to live a pure and simple life on her own. She did not eat anything except bread and water. Dewi, her son, was sent first to Aberaeron and then to Llanddeusant to be taught by the famous teacher, Paulinius. Soon, he began his missionary work – travelling through South Wales and the West of England and establishing key centres such as Glastonbury and Croyland. Later, he returned to St David’s and despite a difficult dispute with local Irish Prince, Boia, established a new Centre which grew to be the headquarters for the Church in Wales. He was made an archbishop during a pilgrimage to Jerusalem with fellow missionaries Teilo and Padarn. Dewi will be especially remembered for his first miracle in Llanddewibrefi when the land rose under his feet in a public meeting so that everybody could hear him. Calan Gaeaf is the first day of winter (1st November). The night before (31st October) is known as Noson Calan Gaeaf or Ysbrydnos – when the spirits come out to visit. Originally this was a Pagan festival where people celebrated the end of the summer and the end of the old year. People believed that the gap between the living and dead was closer on this night, and spirits could cross into the living side. People wore masks on Noson Calan Gaeaf in order to keep the spirits away. This is why people make nasty faces in pumpkins today and put them in the windows or doors of the house. People didn’t light a fire in their houses on Noson Calan Gaeaf, just in case the spirits would feel at home and want to stay! Another tradition was to make a bonfire. Each member of the family would mark a White stone and throw it into the bonfire. If one of the stones was missing the next day, it meant that there would be a death during the year. ‘Twco Fale’ – Apple Bobbing was also popular. Girls would try to pull an apple out of a barrel of water using only their teeth. The first girl to pull an apple out would be the next to get married. There are also many stories in Wales which include Ladi Wen – a ghost of a girl in White, and the Hwch Ddu Gwta – a black sow without a tail. Have you heard of another story or tradition in your area? / Ydych chi wedi clywed am stori neu draddodiad arall yn eich ardal chi? 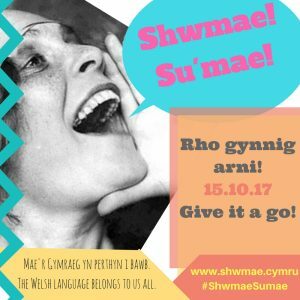 Dydd Sul, 15fed o Hydref 2017 mae diwrnod Shwmae! Su’mae! Beth fyddwch chi’n wneud? 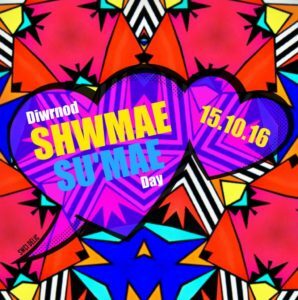 Sunday 15th October 2017 is Shwmae! Su’mae! day. What will you be doing? Yr unfed ar hugain o Ebrill, .